Home | Vinyl Siding Installation | Winter siding installation: Which materials are feasible? Depending on where you live, the weather may soon be changing as winter approaches. While cold temperatures and snow can be great for sledding and breaking out the skis, outside home improvement projects might be another matter. The off-season can be a good time for getting price breaks on exterior siding materials, but will you have to postpone the installation due to inclement weather? It might come down to the product you choose and just how bad Old Man Winter is in your neck of the woods. Brick veneer. According to an article in Masonry Magazine, 40°F. is the temperature that sends up caution flags when installing brick veneer. When the mercury drops to that level, the brick and mortar should be protected and under no circumstances should you allow the mortar to freeze prior to curing. Stucco. This might be the most difficult exterior siding material to install during the winter months. Stucco can't be applied when temperatures dip below 40°F. unless steps are taken to keep the material warm. This usually involves tenting the wall and using some sort of space heater to keep the enclosed area warm. The 40°F. temperature must be maintained for at least 48 hours after the application. Wood siding. Wood can be installed in just about any weather condition, but protecting it is another matter. Sherwin Williams and many other paint manufacturers recommend not trying to paint or stain wood siding if the surface is wet or precipitation is in the forecast. They also suggest not painting when the temperature is predicted to drop below 50°F. unless you're using a product specifically designed for cooler weather conditions. Fiber cement siding. This exterior siding material can be applied in just about any weather, but should be protected from moisture prior to installation. If you nail up wet fiber cement siding, there may be some gaps at the joints when the material finally dries. Vinyl siding. 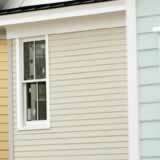 Vinyl siding has many great qualities and all-weather installation can be added to the list. If you or your installer can manage the elements, your vinyl siding should be able to, as well. The approach of winter doesn't mean that your siding installation has to be placed on hold, but it might be a good idea to keep an eye on the weather forecast.